The EDAA provides the AdChoices Icon, which is globally consistent, enabling an ‘integrated’, user-friendly and meaningful European approach. 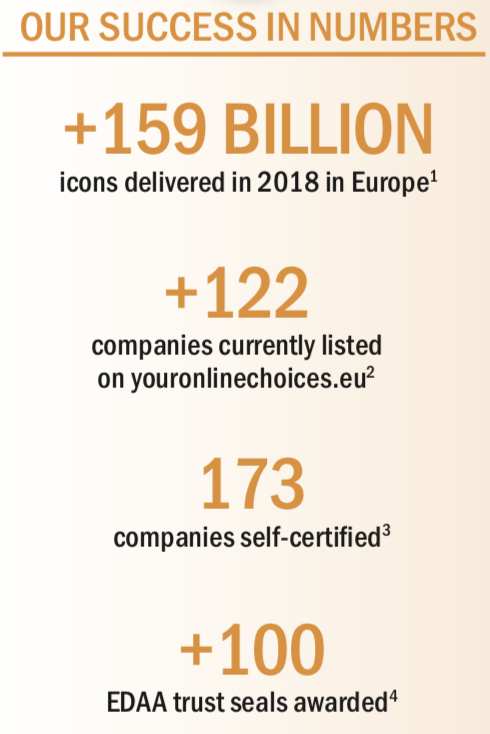 The icon is displayed as an overlay on top of digital ads, and clicks through (usually via an interstitial page) to the innovative Consumer Choice Platform at YourOnlineChoices.eu, where internet users can learn more about data-driven advertising, what it helps fund and how they can exercise control over the collection and use of their data for OBA by some or all participating companies. EDAA also provides the resources necessary for companies to participate on this platform and provide consumers with this choice. The European Interactive Digital Advertising Alliance (EDAA) delivers an industry-wide, future proof and technology-neutral self-regulatory programme, developed with and for the online advertising industry. With growing concerns around consumer privacy and the consumer’s online experience, advertisers are looking for business solutions to rebuild consumer trust through enhanced transparency and control. EDAA’s programme enables businesses to complement existing legislation, whilst ensuring that the online advertising industry continues to help Europe’s digital sector thrive and innovate. What does EDAA do for companies? What does EDAA do for consumers?